People are waiting in long, winding lines at gas stations in Mexico City. Thousands of troops have been deployed to guard pipelines across Mexico. Fuel is being diverted to tankers accompanied by armed vehicles. 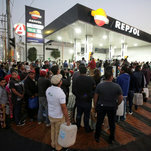 These are the signs of a growing crisis in Mexico, where the government’s newly assertive tactics to combat fuel theft from pipelines have set off days of shortages in the capital and at least seven central states. So how did the country get here? Fuel thefts have contributed, but to what extent? Criminal gangs known as huachicoleros have long targeted the thousands of miles of pipeline that run through Mexico, often in rural areas, carrying gasoline from refineries to distribution points. They tap into a pipeline, siphon gas and resell it, or they work with corrupt insiders to steal the fuel. The cheap, stolen fuel has created an alternative market in many rural communities, but it has also cost the government dearly. President Andrés Manuel López Obrador said some 60 billion pesos, or $ 3.14 billion, in fuel was stolen last year. These illegal taps can also be dangerous. When a pipeline blew up in central Puebla State in 2010, at least 27 people were killed, many dozens were injured and homes were destroyed. On Wednesday, the pipeline that runs from the coastal city of Tuxpan to Mexico City was sabotaged in retaliation for the new government crackdown, reducing the supply of fuel to the capital, the president said. What has Mexico’s new president done? As part of the crackdown begun by Mr. López Obrador, who took office in December, pipelines vulnerable to theft have been shut and the fuel has been diverted to guarded trucks, a slow and logistically complicated process. Pemex, the state-run energy company, said the new transportation methods had caused delays in the delivery of gasoline to service stations. The long lines, it said, did not result from actual fuel shortages. Mr. López Obrador said Friday that 4,000 military and police personnel had been deployed to secure strategically important portions of pipeline, which stretch out some 375 miles and ordinarily transport around 400,000 barrels of gasoline per day. He did not say when fuel would resume flowing through the closed sections, but vowed to continue with his efforts to stem the thefts. The thefts have been a result in part of the “incompetence or complacency” of local authorities, he said. Despite the long lines at the pumps, Mr. López Obrador showed no sign of changing his approach. He said the amount of stolen fuel had dropped significantly as a result of his tactics. “I have said it before, and I’ll say it again: Let’s see who gets tired first, because we will stop the fuel theft,” Mr. López Obrador said. How is the crisis affecting Mexicans? Metropolitan Mexico City, with a population of more than 20 million, has had days of shortages. Gas stations have been forced to close, businesses reliant on fuel for transportation have suffered, and millions in losses have been reported. While the president’s strategy may have slowed thefts in the short term, experts say the current strategy is unsustainable. Asael Nuche, risk director for Etellekt, a consultancy that studies the issue, said in a column published in El Heraldo de Mexico that the government’s moves were costly and ultimately insecure. “There is no method of transportation more efficient and economical than the pipelines, therefore the only option for the federal government is retaking control of them,” he wrote. Business people say the fuel crisis has already been harmful. Gustavo de Hoyos, the leader of Mexico’s employers association, Coparmex, said at a news conference on Thursday that a survey of 3,500 businesses had found losses of more than $ 60 million. For now, drivers are resigned to the waits, but tempers are fraying. “This isn’t the way to do it,” said Javier Cruz, a taxi driver who said he had spent three hours before reaching the pump. Who did he blame? Mr. López Obrador. Paulina Villegas contributed reporting from Tijuana, Mexico, and Elisabeth Malkin from Mexico City.